Ever since Antiquity, humans have never lacked imagination in extracting the essence of fruit, roots and various plants and transforming it into a nectar that, if it does not make one immortal, does raise spirits. Pressing, fermenting, distilling, macerating, heating and cooling are all part of an alchemy that prospered in the Alpine valleys and is now reinventing itself. By Henri Pelletier, journalist and inveterate enjoyer of all things in dish and glass. But what is in the little cask ? A Saint-Bernard without the little cask hanging from its collar ? Quite unthinkable ! Or almost. But what does the famous little cask contain ? A brandy made of Alpine plants ? An elixir to be dispensed immediately to travellers in distress ? Or is it not simply a very old wives’ tale that has been disproved by advances in medical science ? An inquiry by Jean-Loup Fontana, curator at the Roudoule environmental museum in the Gavot region to the north of Nice. Therapy or innocent fun ? Since the 1700s, Chartreuse Diffusion, Cherry-Rocher and Teisseire have built empires on their know-how in extracting the delicate flavours of Alpine plants and fruit. Their liqueurs and syrups are now sold as far and wide as New York. But how were these nectars from the Dauphiné originally consumed ? By Salomé Pellat-Revel, Ph.D student in modern history at the University of Grenoble. 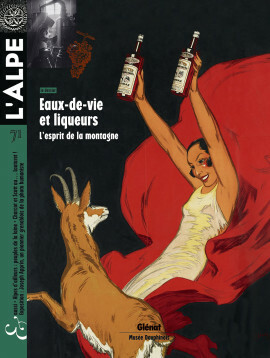 Advertising for the Swiss liqueur was a bit off the wall, to say the least. Particularly for the period, just around 1900. Current marketing experts have something to learn from the iconoclastic images that constituted an impressive exhibition at the Ormonts museum. By Mary-Claude Busset-Henchoz, curator at the Ormonts museum. The Chartreux left traces, though occasionally very faint, in the landscape of the Alpine region. Carlo D’Alessandro and Nadège Druzkowski, two artists recently discovered by the Glénat Foundation, have captured the spirit that transformed the natural desert into a human abode. Two magnificent approaches ranging from the spiritual to the famous liqueur, via work in the fields and metallurgy. 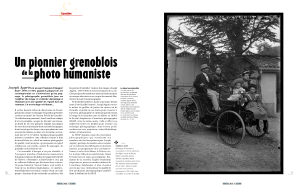 By Jean Guibal, head curator of cultural heritage and director of the Musée dauphinois. 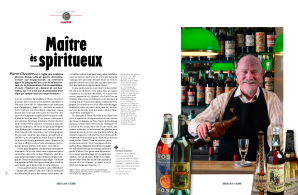 Pierre Chevrier has been on the lookout for the best bottles. For over 40 years. Similar to a world map, his collection reproduces the geography of the macerating, fermenting and distilling arts. He can tell the story of each and every one of his bottles because « it is not the possession of an object that counts, but understanding it ». By Stéphane Boisseaux, Ph.D in political science and researcher at the University of Lausanne. In the Tyrol, distilling remains a very lively tradition. Even today, schnapps is still made by almost 4 000 producers. Among the specialities of the region in southern Austria are Krautinger, made from turnips, and Spänling, made from wild prunes. A look at a traditional drink that has gone about reinventing (and selling) itself. By Ulrich Jakob Zeni, head of the Tyrol chamber of agriculture. 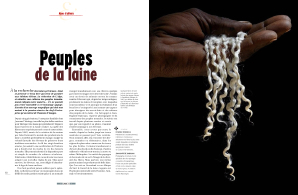 A remarkable book from Éditions Glénat sets off in search of marvellous wools. 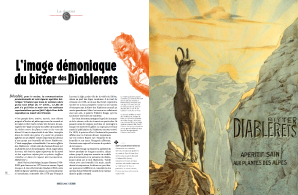 The editorial team at L’Alpe, extremely attentive to the cultures of transhumant peoples (ever since issue no. 3! ), could not help but applaud this moving tribute. Excepts from a magnificent book that owes as much to the passion of a business leader as to the talent of a photographer. By Dominic Dormeuil, president of the Dormeuil company, and Jean-Baptiste Rabouan, photographer and writer. Polar expeditions started in the Hautes-Alpes department at the Lautaret pass ! In 1908, Englishman Robert Falcon Scott and Frenchman Jean-Baptiste Charcot tested new, motorised sleds prior to heading off to the Antarctic. The trials served to improve the sleds. By Serge Aubert (1966-2015), director of the Alpine botanical garden at the Lautaret pass. Joseph Apprin was an unusual photographer. Between 1890 and 1908, when most of his contemporaries took interest exclusively in landscapes, the man from Grenoble decided to explore his period and took a closer look at humans with an extraordinarily insightful eye. A very revealing exhibition. 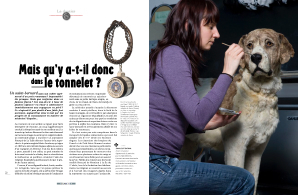 By Isabelle Lazier, head curator of cultural heritage and director of the Ancien Évêché museum.